Wild Rocket at Mount Emily – Fly Me to the Moon! Let me just begin by saying that Wild Rocket is one awesome, awesome restaurant. My main purpose in going there is to try out the desserts, more specifically, the warm chocolate lava cake. Whether the main courses are any good is of secondary importance to me. But boy, do they impress! Despite its rather remote location nestled at the top of Mount Emily, there is quite a crowd at this 40-seater restaurant on a Friday evening. That must say a lot about the quality of the food! Wild Rocket is run by Chef Willin Low, who was previously a lawyer. He loved cooking so much he eventually stopped his practice to open the restaurant at Hangout Hotel, naming it after his favourite salad leaf (not the space missile!). Even during the evening chow hours when the restaurant is brimming at full capacity (with mostly yuppies and stockbrokers), our orders arrive swiftly. Off the pasta menu, I have chosen the crab meat linguini with chilli tomato cream. It is perfect. Not just excellent, but perfect. The cheery bright orange speckled with green simply makes the dish so colourful and inviting! It’s hard to find the right words to describe the unusual taste. Okay, intriguing, that’s the word! 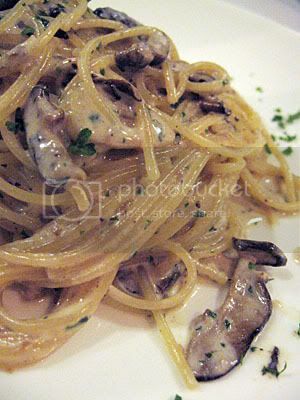 I have never really enjoyed cream-based pasta, but for the first time I am actually loving it! There is just so much flavour and spice in the chilli tomato cream. I slurp down every last bit of the pasta which, by the way, is of an ample portion that would satisfy any full-grown man. The other pasta we have ordered is the Atlantic cod linguini cooked in white wine sauce. It is quite spicy and has a very peculiar sourness due to the lime zest. Like the crab meat linguini, it has been cooked to al dente perfection. It sure looks like you can’t go wrong with pasta at Wild Rocket! Finally, the desserts, the primary reason why Wild Rocket is in my list of “restaurants to check out” in the first place. I have a soft spot for warm chocolate lava cake. Just give me a mound of it and I’ll be as happy as a bouncy 3 year old! The dark lava chocolate gateau comes with two options. You can have it with either vanilla ice cream or flambé banana. Vanilla ice cream is the way to go (at least for me)! As for the flambé banana, which we have thought would have an actual flame somewhere, it’s basically just grilled banana. The thin cake layer holds the delectable warm chocolate lava that oozes out as you slice a fork through it. Wow, my entire mouth just filled with saliva! A cup of black coffee would have gone perfectly with the chocolate cake, putting an end to a very cosy dining experience at Wild Rocket. Even with its slightly posh slant, the restaurant still exudes a sense of homeliness and comfort. I rarely visit the same restaurant more than once unless it is really, really good. Wild Rocket definitely fits into this category. When it comes to food, service, decor and ambience, Wild Rocket has certainly gotten all of it right – a rarity. The good things do not end here. Chef Willin has opened a bar next door by the name of Wild Oats. Judging by the standards of Wild Rocket, Wild Oats definitely looks promising! Is anyone intrigued yet? Also check out burger restaurant, Relish, another endeavor by Chef Willin. The price for radio-controlled toy robots for children is slightly higher than for mechanical robots and modular models. But the possibilities of such devices are not great as an example. Some models of radio-controlled robots use a smartphone or tablet as a remote control. You can find best robots for kids at Robottler.com. There are models of robots that use solar batteries, which provide energy to the electric motor. Such toys do not require additional power sources, and the use of solar batteries represents the widest field of activity. Wild Rockets is indeed a good restaurant. The last time I was there, I had the steak and adventurously, the Laksa Pesto! Both were good…the steak was a bit cold when served (probably due to too much time taken on decorating the plate!) but still tender. 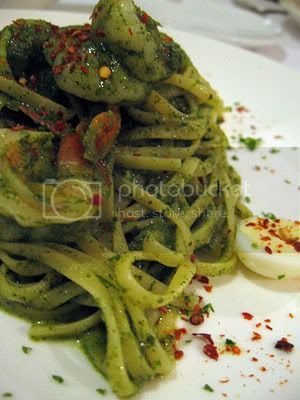 The laksa pesto was really an interesting cross-cultural mix of western and asian. For desserts, I chose the strawberry cheesecake which was a nice touch to my meal. Service was excellent with those friendly waiters. For Wild Oats, I was there for its chicken wings which is served with either thai chilli sauce or cream cheese. I asked for both and it was good. What’s there not to like about fried chicken wings right? Pity that the wings was a tad too thin for me….I didnt had enough of it! Everything was washed down with the Lambrini….which is some sort like a thin beer but it took the oilness out of the fried stuffs. Both times I was there, I caught sight of Willin Low. He’s really one of the coolest local chef around! Can’t wait to go to Wild Oats for a hot date! Awesome! taste so great! can taste it just by reading your words! Yes! The Strawberry Cheesecake is a must try! Damn! Everyone knows this place already! You’re abroad most of the time these days, so you’re excused! Cool find… its really informative for people who dun have time to go around looking for great place for dessert. Back in Australia, most of the cafes serve rich and sinful desserts complimented with quality coffee, but now back in Singapore, I must say looking such cafes is hard. So far, I’ve only been amazed by the dessert selection in NYDC Cafe, maybe everyone can give their recommendation of desserts from NYDC? The next time you are there, remember to just look up from your good food from time to time. You can’t miss Willin who’s in his chef’s uniform (of course!) with his name on it. Rather thin and lanky and with brains to boot! I don’t know about such good restaurant too and I’m in Singapore all the while! Hmm, a consolation price for you? I love lava cakes as well, I had my first cake at Delifrance, $2 for a lava cake when we purchase a main course. What a deal! Wild Rocket is pretty cool!! the main course (or at least this was what was practised when i was there with my friends), before clearing all the plates which i’ve never seen such service in other restaurants. And if i am not wrong, Wild Rocket doesn’t serve Chicken. So don’t bother looking for it on the menu. Keke.. Cheers.. BTW, do you happen to frequent Japanese places? Perhaps you might want to introduce some chick places to your readers ? i used to work there, the people there are great..friendly..
know wat ? luv watching yr Tue, Ch U program on tv. am very impressed with yr culinary skills … with you so young some more. juz curious; is there anything you cannot/ do not know how to cook ? l luv food, all types. tho good food really matters to me, i eat to live. cannot afford to ‘live to eat’. was in the fastfood line after i left sch, with kfc. had a chance to run shop/ outlet @woodlands. dat being the case, we do have sth in common – FOOD. enuf said, bye for now.